The AGM-158 JASSM (Joint Air-to-Surface Standoff Missile) is a low observable standoff air-launched cruise missile developed in the United States. It is a large, stealthy long-range weapon with a 1,000 pound (454 kg) armor piercing warhead, but a number of problems during testing delayed its introduction into service until 2009. As of 2014, the JASSM has entered foreign service in Australia, Finland, and Poland. An extended range version of the missile, the AGM-158B JASSM-ER (Joint Air-to-Surface Standoff Missile-Extended Range), entered service in 2014. By September 2016, Lockheed Martin had delivered 2,000 total JASSMs comprising both variants to the USAF. The JASSM project began in 1995 after the cancellation of the AGM-137 TSSAM project. The TSSAM was designed as a high precision stealthy missile for use at stand-off ranges, but poor management of the project resulted in rising costs. Since the requirement for such weapons still existed, the military quickly announced a follow-up project with similar goals. Initial contracts for two competing designs were awarded to Lockheed Martin and McDonnell Douglas in 1996, and the missile designations AGM-158A and AGM-159A were allocated to the two weapons. Lockheed Martin's AGM-158A won and a contract for further development was awarded in 1998. The AGM-158A is powered by a Teledyne CAE J402 turbojet. Before launch the wings are folded to reduce size. Upon launch the wings deploy automatically. There is a single vertical tail. Guidance is via inertial navigation with global positioning system updates. An imaging infrared seeker provides target recognition and terminal homing. A data link allows the missile to transmit its location and status during flight, allowing improved bomb damage assessment. The warhead is a WDU-42/B 450 kg (1000 lb) penetrator. The JASSM will be carried by a wide range of aircraft: the F-15E; F-16; F/A-18; F-35; B-1B; B-2; and B-52 are all intended to carry the weapon. The Center for Strategic and Budgetary Assessments (CSBA) has suggested lightening the warhead of the AGM-158A to increase its range. That way it would be able to be fired a greater distance from enemy air defenses while being cheaper and available in greater numbers for protracted conflicts than the AGM-158B JASSM-ER variant. In 1999, powered flight tests of the missile began. These were successful, and production of the JASSM began in December 2001. The weapon began operational testing and evaluation in 2002. Late that year, two missiles failed tests and the project was delayed for three months before completing development in April 2003. Two more launches failed, this time as a result of launcher and engine problems. In July 2007, a $68 million program to improve JASSM reliability and recertify the missile was approved by the Pentagon. A decision on whether to continue with the program was deferred until Spring 2008. Lockheed agreed to fix the missiles at its own cost and has tightened up its manufacturing processes. 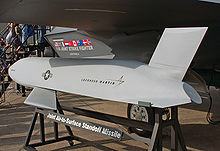 On 27 August 2009, David Van Buren, assistant secretary of the Air Force for acquisition, said that there would be a production gap for the JASSM while further tests were held. Further tests in 2009 were more successful however, with 15 out of 16 rounds hitting the intended target, well above the 75% benchmark set for the test. As such JASSM is now cleared for service entry. The United States Air Force plans to acquire up to 4,900 AGM-158 missiles. Meanwhile, the United States Navy had originally planned to acquire 453 AGM-158 missiles but pulled out of the program in favor of employing the proven SLAM-ER. In 2006 the Australian government announced the selection of the Lockheed Martin JASSM to equip the Royal Australian Air Force's F/A-18 Hornet fighters. This announcement came as part of a program to phase out the RAAFs F-111 strike aircraft, replacing the AGM-142 Popeye stand off missile and providing a long-range strike capability to the Hornets. JASSM was selected over the SLAM-ER after the European Taurus KEPD 350 withdrew its tender offer, despite the KEPD 350 being highly rated in the earlier RFP process, due to their heavily involvement in the series preparation for the German Air Force, their troop trials in South Africa and their final negotiations with the Spanish Air Force which finally led to a contract. As of mid-2010 the JASSM is in production for Australia and will soon enter service. Finland had also previously planned to purchase JASSM missiles for the Finnish Air Force as part of modernization plans of its F/A-18 Hornet fleet. However, in February 2007 the United States declined to sell the missiles, while agreeing to proceed as planned with other modernization efforts (the so-called Mid-Life Update 2, or MLU2). This episode led to speculation in the Finnish media on the state of Finnish – American diplomatic relations. 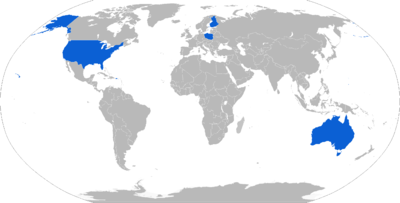 However, in October 2011 the US DSCA announced that they had given permission for a possible sale to Finland. An order, valued 178.5 million Euros was placed in March 2012. Since 2012 Lockheed has received three Finnish integration-related projects. Finland's integration work is scheduled to be completed by the end of 2016. South Korea has sought the JASSM to boost the South Korean Air Force's striking capability but were rebuffed by Washington's unwillingness to sell the missile for strategic reasons. The South Korean government instead turned their attention towards the Taurus KEPD 350 missile. In 2014, Poland expected the Congressional approval for the purchase of the AGM-158 JASSM to extend the ground penetration capabilities of their top-of-the-line F-16 Block 52+ fighters. If the US Congress gives its approval, the missiles (around 200) should be deployed with the Polish Air Force in 2015. Congress approved the sale in early October, and negotiations concluded in early November 2014. NATO member Poland signed a $250 million contract to upgrade its F-16s and equip the jets with (AGM-158) JASSM advanced cruise missiles in a ceremony at Poznan AB, Poland, on 11 December 2014. The missiles are expected to enter operational service in 2017, and Poland is contemplating an additional purchase for the long-range JASSM-ER version. In December 2015 the production contract for Lot 13 was signed. The contract includes 140 JASSMs for Finland, Poland and the US, 140 JASSM-ER missiles for the US, and data, tooling and test equipment. It is said to be the last production lot that will include non-ER versions. Poland's first modified F-16s should be ready by 2017, when the first missiles are delivered. The work is scheduled to be complete by June 29, 2019. In November 2016 The U.S. State Department approved the possible sale of 70 AGM-158B JASSM-ER to Poland. The US Air Force studied various improvements to the AGM-158, resulting in the development of the JASSM-Extended Range (JASSM-ER), which received the designation AGM-158B in 2002. Using a more efficient engine and larger fuel volume in an airframe with the same external dimensions as the JASSM, the JASSM-ER is intended to have a range of over 575 miles (925 km) as compared to the JASSM's range of about 230 miles (370 km). Other possible improvements were studied but ultimately not pursued, including a submunition dispenser warhead, new types of homing head, and a new engine giving ranges in excess of 620 miles (1,000 km). The JASSM-ER has 70% hardware commonality and 95% software commonality with the original AGM-158 JASSM. 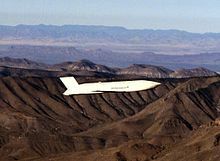 The first flight test of the JASSM-ER occurred on May 18, 2006 when a missile was launched from a U.S. Air Force B-1 bomber at the White Sands Missile Range in New Mexico. The initial platform for the JASSM-ER is the B-1. While both the original JASSM and the JASSM-ER are several inches too long to be carried in the internal weapons bay of the F-35 Lightning II, the F-35 will be able to carry both missiles externally, which compromises the aircraft's stealth features. The JASSM-ER entered service with the USAF in April 2014. Although the B-1 was initially the only aircraft able to deploy it, it was later integrated onto the B-52, F-15E, and F-16; the B-1B can carry a full load of 24 JASSM-ERs, the B-2 16 missiles, and the B-52 outfitted with the 1760 Internal Weapons Bay Upgrade (IWBU) is able to carry 20 JASSM-ERs, eight internally and 12 on external pylons. The Air Force approved full-rate production of the JASSM-ER in December 2014. It is hoped that fielding of the JASSM-ER will allow the service to save money by retiring the conventional air-launched cruise missile (CALCM), a conventional warhead-equipped version of the nuclear-tipped ALCM, having the long-range conventional strike munition role filled by the newer missile. Integration of the JASSM-ER onto the B-52 and F-16 is expected to wrap up in 2018, with the F-15E completed after that; it was announced that the JASSM-ER achieved full operational capability on the F-15E in February 2018. Lot 15 production contract, awarded in June 2017 was the first consisting entirely JASSM-ER. On 14 May 2015, the head of the Air Force Research Laboratory nominated the JASSM-ER as the optimal air vehicle to carry the Counter-electronics High Power Microwave Advanced Missile Project (CHAMP) payload. CHAMP is an electronic warfare technology that fries electronic equipment with bursts of high-power microwave energy, non-kinetically destroying them. The JASSM-ER was chosen because it is an operational system, so CHAMP is to be miniaturized into the operationally relevant system. In March 2016, Lockheed began analysis on an enhanced wing design to further increase range. The enhanced wing design is scheduled to be incorporated into production Lot 17. The JASSM-ER is also the basis for Long Range Anti-Ship Missile, which is a JASSM-ER with a new seeker. The Air Force used the B-1 Lancer to complete a captive carry test of an LRASM to ensure the bomber can carry it, as both missiles use the same airframe. The LRASM was not originally planned to be deployed on the B-1, being intended solely as a technology demonstrator, but in February 2014 the Pentagon authorized the LRASM to be integrated onto air platforms, including the Air Force B-1, as an operational weapon to address the needs of the Navy and Air Force to have a modern anti-ship missile. In August 2015, the Navy officially designated the air-launched LRASM as "AGM-158C". The LRASM achieved Early Operational Capability on the B-1B in December 2018. In September 2018, Lockheed Martin was awarded a contract to develop an "Extreme Range" variant of the AGM-158. The weapon would weigh about 5,000 lb (2,300 kg) and deliver a 2,000 lb (910 kg) warhead out to a range of 1,000 nmi (1,900 km; 1,200 mi); it is planned to be ready by 2023. The JASSM was first employed during the 14 April 2018 missile strikes against Syria during the Syrian Civil War. Two B-1 Lancers fired a total of 19 JASSMs as part of strikes against three Syrian government alleged chemical weapons targets. All 19 JASSM missiles were fired at the Barzah Research Center, which was destroyed in the strike. According to Russian state media, two missiles that failed to detonate were found by the Syrian Arab Army and transferred to Russia on 18 April for study;Initial reports stated JASSM-ER missiles were used, but it was later clarified that baseline JASSM models were employed. A mock-up display of the AGM-158 JASSM next to an F-35 prototype. ^ "$68M plan to fix JASSM gets the OK". Air Force Times. ^ "Pentagon To Announce JASSM Decision In 2008 – Amy Butler/Aerospace Daily & Defense Report". Archived from the original on September 27, 2007. ^ "Lockheed $6 Billion Missile Program May Be Killed, U.S. Says". Retrieved 8 October 2015. ^ "Login". Retrieved 8 October 2015. ^ a b Pittaway, Nigel (March 2010). "JASSM introduction to RAAF service". Defence Today. Amberley: Strike Publications. 8 (2): 11. ISSN 1447-0446. ^ a b "JASSM/ No Ma'am – Which Will It Be?". Archive.org. Defence Industry Daily. 12 Oct 2005. Archived from the original on April 6, 2007. Retrieved 3 June 2015. ^ Rivers, Brendan (1 Feb 2006). "JASSM Program Getting Back on Track". Archive.org. eDefence. Archived from the original on March 16, 2006. Retrieved 3 June 2015. ^ Defense Industry Daily (28 May 2014). "Australia Chooses JASSM Missiles on F-18s for Long-Range Strike". Retrieved 26 December 2015. ^ "ADM: ADF Weapons: Was JASSM the right choice?". Retrieved 8 October 2015. ^ "USA Refuses to Sell Finland Missiles for Hornet Fighters". Yle Uutiset. Retrieved 8 October 2015. ^ "Finland – AGM-158 Joint Air-to-Surface Standoff Missiles (JASSM)" (PDF). Defense Security Cooperation Agency. Retrieved 26 December 2015. ^ "Suomen Puolustusministeriö – Suomi hankkii pitkän kantaman ilmasta-maahan ohjusjärjestelmän". Retrieved 8 October 2015. ^ Hemmerdinger, Jon (10 January 2014). "Lockheed moves forward with Finland's JASSM integration". Flightglobal.com. Retrieved 26 May 2015. ^ "Hornet-kalusto saavuttaa suorituskykynsä huipun". Finnish Defense Forces. 10 Apr 2015. Archived from the original on 2015-09-04. Retrieved 4 Dec 2015. ^ Sabak, Juliusz (6 Nov 2014). "JASSM for Poland – Is it worth to pay the price?". Defence24.com. Retrieved 26 May 2015. ^ "S.Korea to buy bunker busting missiles from Europe". www.reuters.com. 4 April 2013. Retrieved 16 November 2013. ^ "Parliament advises review of Taurus, Global Hawk acquisition plan". www.koreaherald.com. 5 July 2013. Retrieved 16 November 2013. ^ "The Aviationist » Why is Poland purchasing Joint Air-to-Surface Standoff Missiles for its F-16s?". The Aviationist. Retrieved 8 October 2015. ^ "Poland – JASSM-ER with Support - The Official Home of the Defense Security Cooperation Agency". Dsca.mil. Retrieved 3 February 2019. ^ "GAO-13-294SP DEFENSE ACQUISITIONS Assessments of Selected Weapon Programs" (PDF). US Government Accountability Office. March 2013. pp. 81–2. Retrieved 26 May 2013. ^ Pappalardo, Joe. "B-1 Pilots Turn Their Bombsights to the Pacific." Popular Mechanics. April 9, 2012. ^ Croft, John. "USAF sets 2013 entry for extended-range JASSM." Flight International. 06 Apr 2010. Accessed 09 Dec 2010. ^ Karas, Rachel (2017-06-02). "Air Force, Lockheed ink deal for first entirely JASSM-ER lot". Inside Defense. Retrieved 2017-06-06. ^ Mujumdar, Dave. "Lockheed LRASM completes captive carry tests." Flight Global, 11 July 2013. Accessed 12 July 2013. ^ Majumdar, Dave (13 March 2014). "Navy to Hold Contest for New Anti-Surface Missile". U.S. Naval Institute. Retrieved 13 March 2014. ^ Lockheed Martin delivers first Long Range Anti-Ship Missiles. Flight International. 20 December 2018. ^ US Air Force Moving Forward with Lockheed's JASSM-XR missile development. Air Recognition. 11 September 2018. ^ America's Next Cruise Missile Will Strike From 1,000 Miles Away. Popular Mechanics. 12 September 2018. ^ Trevithick, Tyler Rogoway and Joseph. "United States, France, And UK Begin Air Strikes On Syria (Updating Live)". The Drive. Retrieved 3 February 2019. ^ Navy Vessels, B-1s Obliterate 3 Syrian Targets in Strike. Military.com. 14 April 2018. ^ Copp, Aaron Mehta, Tara (17 April 2018). "Coalition launched 105 weapons against Syria, with none intercepted, DoD says". Military Times. Retrieved 3 February 2019. ^ "US-led strikes on Syria: What was hit?". Bbc.com. 16 April 2018. Retrieved 3 February 2019. ^ "Эксперт рассказал, как Россия использует найденные в Сирии ракеты США". RIA Novosti. 19 April 2018. Retrieved 19 April 2018. ^ Pawlyk, Oriana (17 April 2018). "US May Ramp Up Buy of the Missile That Just Made Combat Debut in Syria". Military.com. Retrieved 3 February 2019. Wikimedia Commons has media related to AGM-158 JASSM.